Earlier, Mahesh Babu said Sitara is "exactly like his mother"
Remember Mahesh Babu's post in which he said his daughter Sitara looks "exactly like his mother"? Well, months later, his wife Namrata Shirodkar sort of refuted Mahesh Babu's claim in her Instagram post. 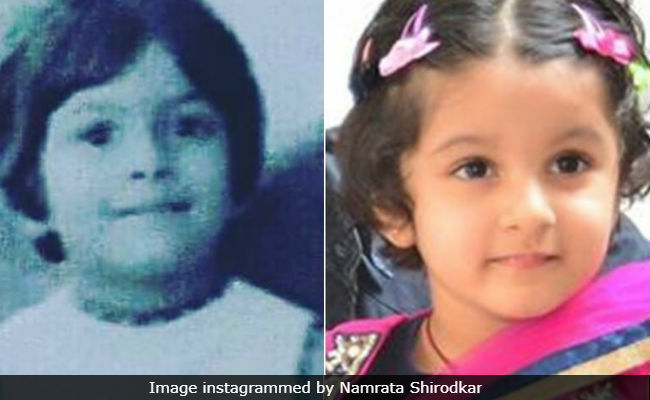 Namrata juxtaposed Sitara's childhood picture with an old black-and-white picture tagged to her sister Shilpa Shirodkar, who in turn shared it on her Instagram page. Namrata's caption read "twinning" but she did not elaborate whether it's her photo or that of Shilpa (several Instagram users are debating over it). Those who believe that it's Shilpa's picture have added comments like: "Shilpa and Sitara are so alike." But some Instagram users are unconvinced and also think that Sitara resembles her grandmother Indira Devi. "But she looks more of Mahesh garu's mother," said another Instagram user. Namrata and Shilpa Shirodkar are granddaughters of actress Meenakshi Shirodkar. Namrata is the younger of the two sisters, who are both actors. Namrata won Miss India title in 1993 and her Bollywood debut film arrived five years later. She had a cameo role in Salman Khan and Twinkle Khanna's Jab Pyaar Kisise Hota Hai and in the same year she starred opposite Arshad Warsi in Hero Hindustani. Namrata went on to star in films such as Pukar, Vaastav and Astitva. She was last seen in Gurinder Chadha's Bride and Prejudice, released in 2004. She married Mahesh Babu, whom she met on the sets of Athadu, in 2005 and quit films. Mahesh Babu and Namrata Shirodkar are parents to six-year-old Sitara and 11-year-old son named Gautam. Shilpa Shirodkar is known for her role in films like Kishen Kanhaiya, Hum and Gopi Kishan. She made her television debut in 2013 with Ek Mutthi Aasmaan and she currently features in TV show Savitri Devi College & Hospital.